BBC Sport brings you extensive coverage of the 2014 World Track Cycling Championships in Colombia across BBC television, online and mobile devices. Live coverage of day one of the Track Cycling World Championships from Cali, Colombia. Live coverage continues of day two of the Track Cycling World Championships from Cali, Colombia. 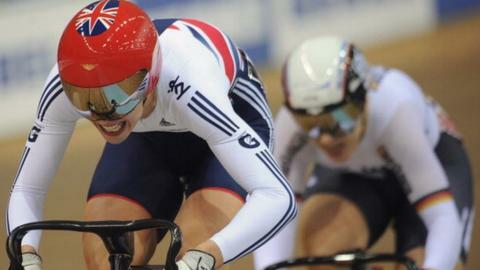 Live coverage continues of day three of the Track Cycling World Championships from Cali, Colombia. Jonathan Edwards presents highlights from the Track Cycling World Championships in Colombia. Great Britain have established themselves as the dominant force in track cycling in recent years, and will have high hopes of returning from Cali with another impressive medal haul. The British women's team pursuit squad will certainly begin as red-hot favourites - only three months ago they broke their own world record, shaving three seconds off their previous best. Three-time Olympic gold medallist Jason Kenny will also be in action, and will hope to successfully defend the keirin world title he won in Minsk last year. Commentary is from Simon Brotherton and Chris Boardman. Coverage continues on day five of the Track Cycling World Championships from Cali, Colombia. Jonathan Edwards introduces highlights of the final day's action at the Track Cycling World Championships in Cali, Colombia, where Britain's Laura Trott began as one of the favourites for the women's omnium. Trott won two gold medals at the 2012 Olympics, including one in the omnium, but in the corresponding event at last year's World Championships she ended with silver behind the USA's Sarah Hammer. Trott's partner, three-time Olympic gold medallist Jason Kenny, was also one of the leading contenders in the men's sprint. NB Fixtures and event start times are subject to change. The BBC is not responsible for any changes that may be made.